Thursday is GURPS-Day, and release day! We get more goodness today with Loadouts: Low-Tech Armor. I had a hand in this one, as you cans see – I was listed as Lead Playtester. Interestingly enough, this title, so to speak, came last. I was approached by +Steven Marsh a while back to see if I could potentially check up on the loadouts. Sure, I thought. Then I got the manuscript. Holy. Crap. Over twenty different historical warrior-types, each with anywhere from just a few to nearly two dozen individual pieces of armor, each written up, sometimes a bit cryptically, using +Dan Howard‘s Instant Armor style. All in all I think I calculated that there were something like four hundred individual pieces to validate. A lot of work went into this. Yow. I needed help, and I knew it. I solicited the help of the six people who joined me in this task – mostly from the Technical Grappling playtesters, who’d been so very helpful to me during my own project. Then I divided up the loadouts into piles, each with an approximately equal number of pieces. I played manager, and when the first round of commentary was done, finished up all unvalidated pieces. I then, just to be sure, scrambled the piles again, and a new person double-checked the loadouts. Many comments were made, but that wasn’t really our job. We had plenty of time, since the Ogre was in the way, but we checked nearly 400 pieces of armor – twice each – in about three months. I hope you guys all run out and buy the book, and if you like it, I’m sure there could be more. Loadout lists are like +Hans-Christian Vortisch infamous Big Lists of Guns. They might get a bit of eyebrow-raising here and there (‘did you really just publish 300 guns whose stats are nearly indistinguishable?’) but when the very next moment there’s a post on the forums saying “Hey, I have this gun here, which is a 5.56x45mm gun with a 20” barrel, but has a different name, what are it’s stats?” rather than just using the darn listing for the M16, you can see how players (or maybe just GURPS players) eat this stuff up. For as long as mankind has engaged in violence, we have sought ways to make the sticks, stones, and swords hurt just a little less. GURPS Low-Tech and GURPS Low-Tech: Instant Armor provide the bits and pieces needed to customize your defenses . 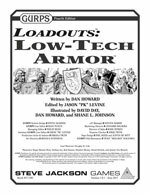 . . but when you care about historical accuracy, want a provencombination of defensive gear, or are simply short on time, GURPS Loadouts: Low-Tech Armor has you covered. Take advantage of new gear, including rhinoceros-hide armor, pectorals, Roman “scale mail,” Japanese face protection, padded jacks, and a wide range of shields and horse barding. Whether you’re playing a historical game or one of pure fantasy, GURPS Loadouts: Low-Tech Armor makes equipping your hero a snap – and helps the GM quickly armor hordes of nameless NPC warriors – all in a realistic and believable way. Spend less time poring over equipment lists and more time using that gear to prove your mettle on the battlefield! It was a real pain to number check everything, indeed it was.